There is no room to store the building in Alna Center. All the available flat ground is covered with the ballast pile for next spring's work weekend. TOM? or unparkable parking lot? Keep the parkable parking lot open? So when was it built in the first place? I do not remember it there when I docked at the museum last in 2011 and all I remember is the sculpture. It isn't very old. They erected it to work on their sailing (the Mary E?) and had to take it down per city planning board and shoreland zone ordinance. Pavilion disassembly was finished today. 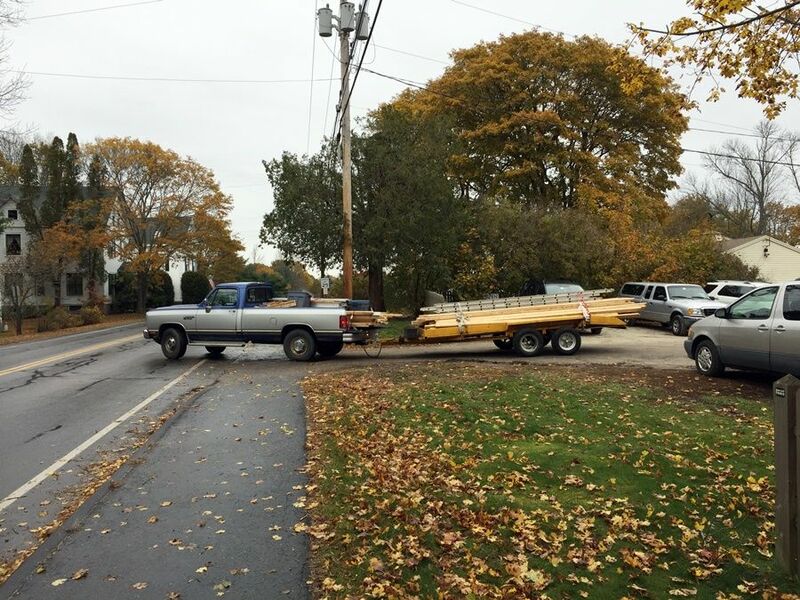 We just have to bring the trailer load of trusses and forklift back to Sheepscot. 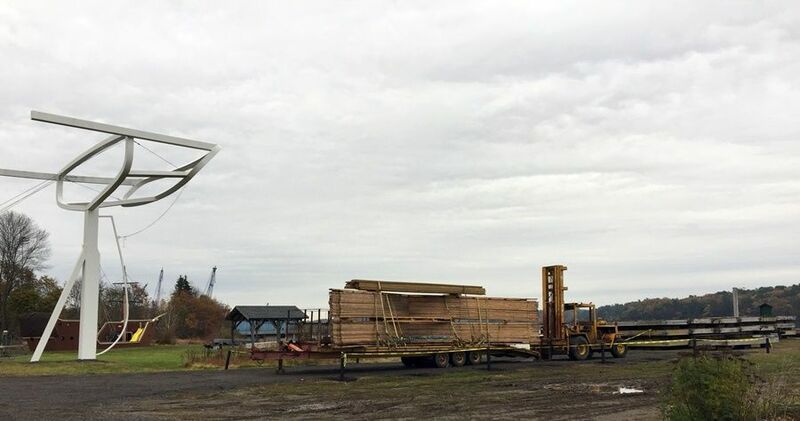 Fred leaving Maine Maritime with the last load of lumber. The trusses and forklift sitting where the pavilion used to be. We own 23 acres at the T.O.M. Quite a lot of FLAT land where a car barn could be put for flat cars and box cars. We do need more car shelter. Leaving wooden cars outside can prove costly. Three tracks can still be put in a Thirty Ft. wide building only that it should be as long as our car-barn is now. Yes, even an open-sided building would serve to keep rain and snow off wooden rolling stock. And if properly designed, such a building could start out as a 40 or 50-foot long building and be added to as necessary, just like what was done with the Sheepscot shop. Such a building at TOM could also serve as a place to hide the basket cases and chicken coops. Or people when it rains. We've been talking about shelter at T.O.M. for sometime now even a small station. It's very good land, but we had to stop clearing it as so many other projects have come up. If we ever lose the right to use the Albee field we'll be very glad we have that land. a Corn Shed that was never at TOM would make a good addition. Covering cars is a good idea. Pavilion = Corn Shed. Love it!! Now does anyone know of a person who'd want to donate a cannery? See, I think it is the best thing for the future... Just imagine the events that could happen, from concerts, bbq, and ice cream socials. Not to mention as a great place for Santa to reside. I know it does work for an historical building but who knows what mock sides could be built. I see an immediate need to provide a better venue at Alna Center to increase attendance at social , musical functions there. The MMM shelter would do this, being modified if needed to attract bands and other entertainment to draw and serve increasing WW&F ridership. Fred's correct--wooden vehicles need as much weather protection as possible. For now, large tarps, used by 2926 and 3751 rebuilders, having past shelter problems, would do the job much cheaper, particularly during the railroad's off=season, if and until other arrangements are possible.